Through the decades, there have been significant advancements with heavy AI subtexts and it’s difficult to pinpoint the exact conception. However, the true inspiration came from none other than the father of computing, Alan Turing. Alan Turing was relentless in his pursuit to uncover the potential for machinery to exhibit intelligent behavior. In 1942, he was charged by Winston Churchill with an impossible task of outsmarting the German Enigma machine. Different parts of the Enigma machine could be set up in different ways and each letter was dynamically enciphered as it was inputted based on those settings. This led to 15,000,000,000,000,000,000, (15 billion billion) possible combinations. Needless to say, a brute force method of going through every combination was not an option. Here come Turing and his team at Bletchley Park to the rescue. 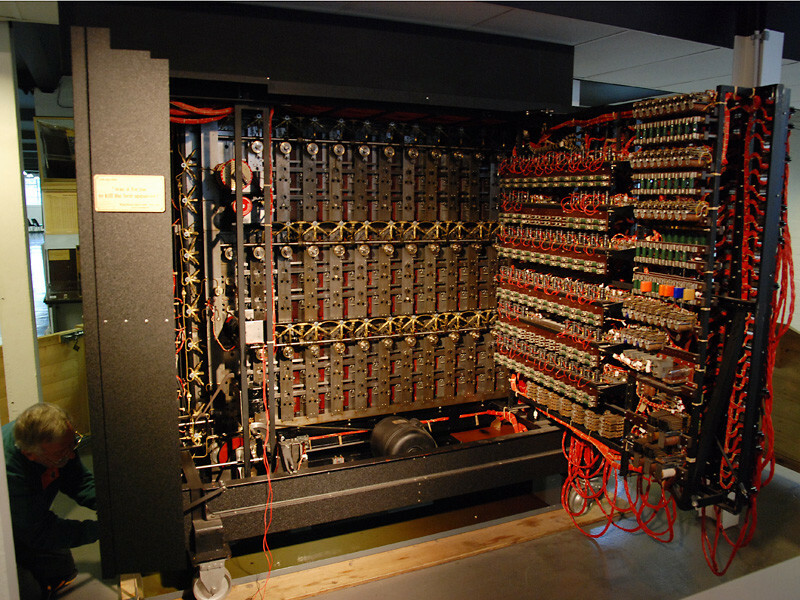 After a superhuman effort, they invented a device called the Turing Bombe that contained the exact wiring of 36 different Enigma machines. After receiving a message, it used logic to eliminate the large majority of combinations and then went through every remaining combination until it found a match. The Allied forces went on to be victorious as a result of their efforts and Turing was immortalized as a hero. Not only that, he was elevated in all technologists’ eyes as the parental figure who gave birth to the revolution that brought us the modern computer. Okay you have seen “The Imitation Game” and nothing about that screamed killer robots to you. How is this relevant? Turing was responsible for the fundamental paradigm shift that empowered technologists around the world to approach impossible problems in a completely new way. The significance of that victory imported upon us the limitlessness of a system comprised of an intelligent machine and a human being. Artificial intelligence was born as a symbol of growth, creativity, and collaboration. The potential of this new-found autonomy spurred brilliant minds all around the world to make remarkable breakthroughs in the field. AI is a term used by many to describe systems that are intelligent in some way. This intelligence could be a result of fixed logic-based rules that have been painstakingly thought through to eventually come up with a device that could make decisions based on the parameters of the world. This device at its heart, contained a mathematical representation of the world that led to very specific bounds within which it could operate. For example, consider a world that we are trying to explain using the equation F(x) = 4x. We are saying that this equation takes an input of “x” and outputs the result of the mathematical evaluation of 4*x. If we inputted the number 2 and received an output of 8, we can rest assured that our mathematical representation is quite in line with the world it is in. However, what if this world expects an output of 10 for an input of 2? In this case, our mathematical model seems awfully rigid since it will always output a result of 8 for an input of 2 and will never be correct in the scenario where the output should be 10. Let’s look at this another way. Imagine that there are specific rules programmed into a robot that define its behavior. For example, anything it sees that has 4 legs is a cat and anything with 2 legs is a human. This rule applies when all the robot sees are cats and humans. However, what if the robot sees a dog? The robot would not recognize it as a dog and immediately uses the formula “4 legs = cat” to perceive the dog as a cat. We can see that the rules programmed into the robot are static and inflexible. They don’t allow the robot to venture outside the strict imposed bounds. Of course, the mathematics used in a variety of AI scenarios scale in complexity to be much greater than the examples above. The main takeaway is that there are problems in our world which require a robust underlying representation that explains past, present, and even future scenarios. Not only that, we want a model that can autonomously develop and get better based on varying experiences through its lifetime. And thus, Machine Learning was born under the expansive umbrella of Artificial Intelligence. ML extended the vision that Turing had of a machine simply exhibitingintelligence to a machine that actively increased its intelligence based on the experiences it had. Just like a human. Now let’s go back to the potential realized at the origins of AI. The potential wasn’t of a machine growing so generally intelligent that it could live undetected in our complex human society. Rather, it was of a system that could get increasingly more effective as it experienced more of the world it is in. With the breakthrough of ML, humans were not the only ones who learned from experiences, machines could as well. The advances in ML have expanded upon this concept and have accounted for a variety of problems that complex models can represent and learn from. 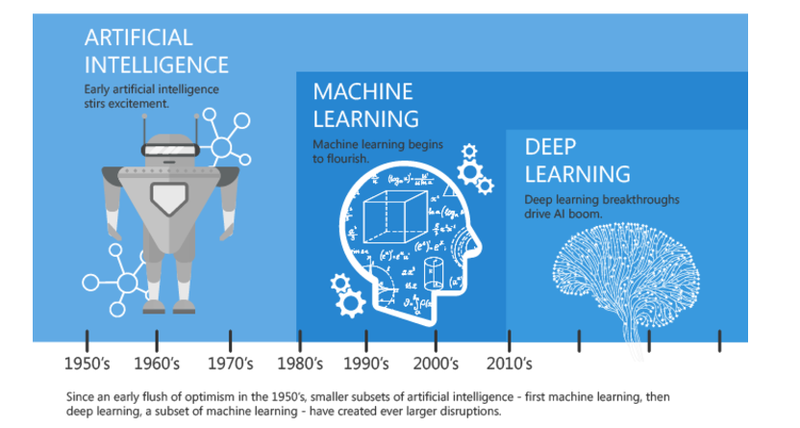 Deep Learning is a subset within ML that really explores the self-sustaining ability of an AI agent to learn from itself and use Artificial Neural Networks to mimic the thought processes of a human being. Deep Learning has many applications in the industry around speech and image recognition. We will explore this topic in greater detail in upcoming articles. There are many other subsets of ML including Supervised Learning, Unsupervised Learning, and Reinforcement Learning. However, the common element among these is the learning. Consider a model created using ML methods. We have a set of experiences that can be fed to the initially naive model along with a set of what we expect the actual result to be. With the input of experience, the model output is then measured against the actual output and the machine learns from this outcome. Now, the machine has either positively reinforced its model from a positive outcome or negatively reinforced the model from a negative outcome. The beauty of this process is that the machine then goes into the next experience with this knowledge. We can see that this input of experience for the robot is critical for it to learn in the right way. Otherwise, the robot will not learn from experiences representative of the world around it, and subsequently perform poorly in actual scenarios. Let’s walk through an example with an online retailer that specializes in selling shoes. They have recently developed a chat-bot that is learning how to interact with a customer asking for advice on which kind of shoes to buy. We would naturally expect that chat-bot to be knowledgeable on the different kinds of shoes available. As an extreme example, if the robot was trained on hats instead, it won’t be able to answer any questions about shoes effectively. In a more probable case, if the robot was trained on shoes but on those that were going out of style or don’t align with the customer interests, that sale would probably still be lost since the customer would immediately disengage and go elsewhere. This is where it becomes very interesting for a domain expert to partner with the chat-bot and impart his/her knowledge akin to a manager guiding a new direct report. Along with effective human computer interaction methods, this is essential to delivering an enjoyable and relevant experience for the end user.